Only six months since the official groundbreaking of its manufacturing plant, Namibia Plastics is already making strides to its goal of entirely curbing the import of plastic products. It was a proud moment for CEO and co-founder, Johan Struwig and his team when he officially handed over the first batch of packaging to Namibia Breweries Limited (NBL) for its premium and world class beer brand, Windhoek Lager. Significant about this handover is the fact that the Windhoek Lager packaging has been an import service for many years but will now be manufactured locally as a result of the new Comexi F2 flexible packaging printer acquired by Namibia Plastics – a machine which, according to Struwig, is a first of its kind in the country and is the ideal start to realize the local plastic manufacturing dream. “If Namibian companies believe in each other, take hands and support each other, we as a nation and as Business Namibia can compete internationally by manufacturing world-class, quality products, locally. The stringent quality expectations of NBL, coupled with the commitment of the O&L Group to conduct business in an environmentally responsible way, gave Namibia Plastics the confidence to invest in world-class equipment when erecting our new factory at Brakwater,” added Struwig. The Comexi F2 flexible packaging printer received a Red Dot Award when it was launched. The “Red Dot” has become established internationally as one of the most sought-after seals of quality for good design. Other companies that also received the “Red Dot” includes Porsche when it launched its new 911 range, and Apple when it launched the MacBook Air, amongst others. NBL was Namibia Plastics’ very first client back in 2011 when the company was established. Struwig stressed that NBL’s support opened even more doors for the manufacturer on the local front, which has seen significant growth in Namibia Plastics over the past seven years – so much so that earlier this year, Namibia Plastics had its ground-breaking of a N$95 Million factory at Brakwater to close the gap of an estimated 50% of plastics currently imported from abroad. Accepting the Windhoek Lager 6-pack brand packaging, Managing Director of NBL, Wessie van der Westhuizen was very pleased at the result and expressed his excitement working with Namibia Plastics going forward. Struwig said the Namibia Plastics manufacturing plant will eventually replace approximately 1000 tons of imports and manufacture it locally, providing even more jobs in Namibia and adding value locally. “With the financial assistance from the Development Bank of Namibia and local investors which include Spitz Capital (a Regulation 29 compliant unlisted investment vehicle with the Government Institutions Pension Fund as principle investor), Namibia Plastics now has a 2660 sqm state-of-the-art manufacturing plant at Brakwater. Caption: Jacky Silver, NBL Innovations Manager (right) inspecting the newly printed Windhoek Lager 6-pack packaging done by the new Comexi F2 flexible packaging printer acquired by Namibia Plastics. 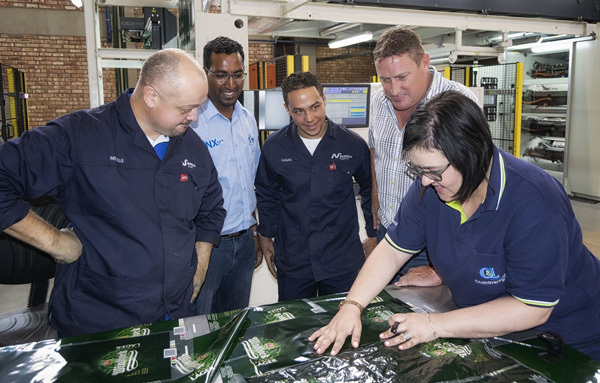 Looking on are: F.L.T.R – Neville Holmes – Manager: Print & Conversion, Namibia Plastics; Suren Govender – Production Manager, Constantia Inks; Fagan Bussel – Factory Assistant, Namibia Plastics, and Wernich Meyer – Director: Trading, Namibia Plastics. 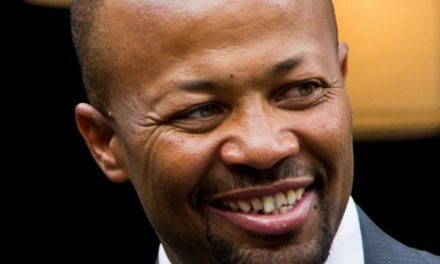 PreviousWho is ahead in the resale stakes between Africa’s two most popular bakkies?